Brewed using the clear waters of Mt. Tenzan and the best sake rice from the Saga plains. 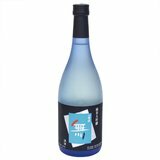 It is an unfailingly dry, masculine sake with an ideal balance between sweetness, sourness, and pungency. Full of body and texture.